Candles burn even during the day at this age based in a 16th-century house, which is one of two remaining wooden buildings in Amsterdam. This bar is located on the Sea Dike (or Zeedijk in Dutch), just a 5 minute walk from Amsterdam’s Central Station. The Aepje means Monkey or the Ape. 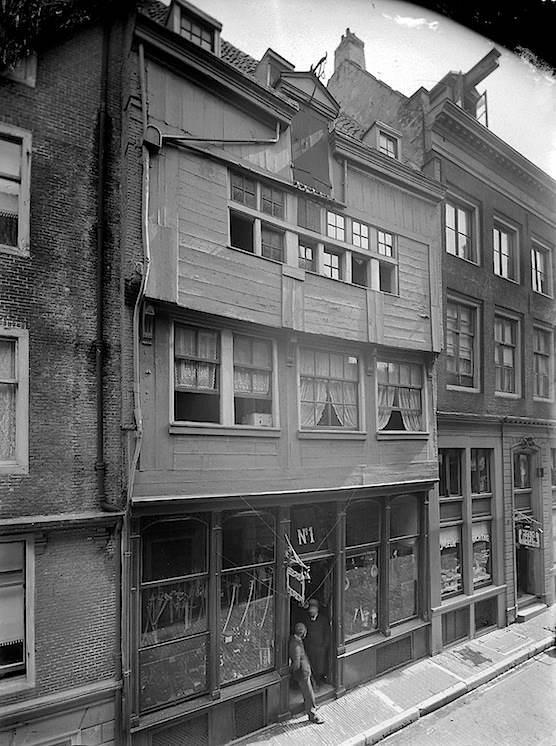 In the 16th-century this was a tavern or a hostel for sailors. The seamen could always stay the night. The exterior of Cafe In ‘t Aepjen is still in the same shape as it use to be: Just plain wood! 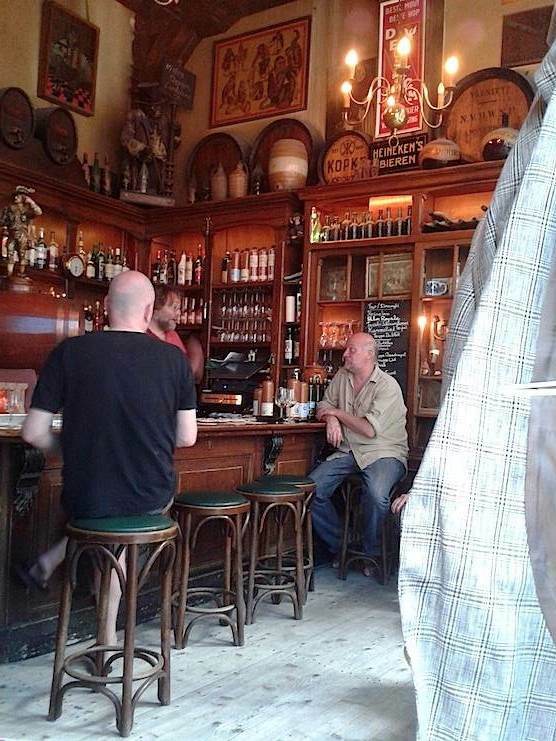 You won’t find many bars in Amsterdam that has a wooden exterior. Obviously, this is material isn’t fire best friend. So, this is main reason why wooden exteriors aren’t much around in Amsterdam. 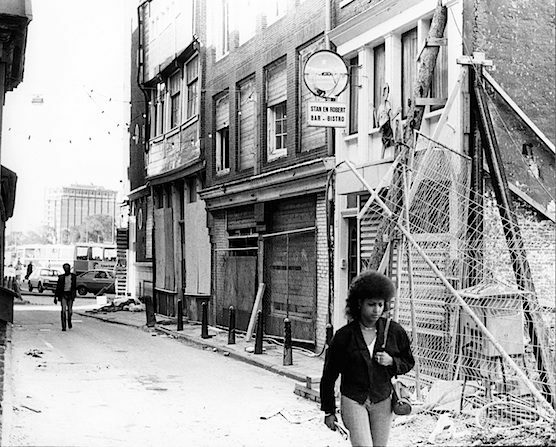 An old picture of Cafe In ‘t Aepjen on Amsterdam’s Sea Dike. This picture was shot between 1910 and 1935. This is what it looked like in 1986. 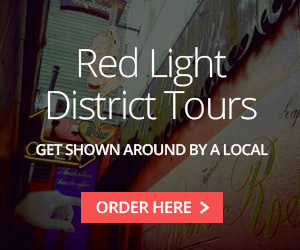 In a time when the Red Light District was not a safe place. Cafe In ‘t Aepjen has a washed floor in this brown café as the Dutch like to call it. Red velvet stool tops. A set of three apes in bronze stare at you. They replace the real ape a customer and sailor left behind as payment for his drinking. 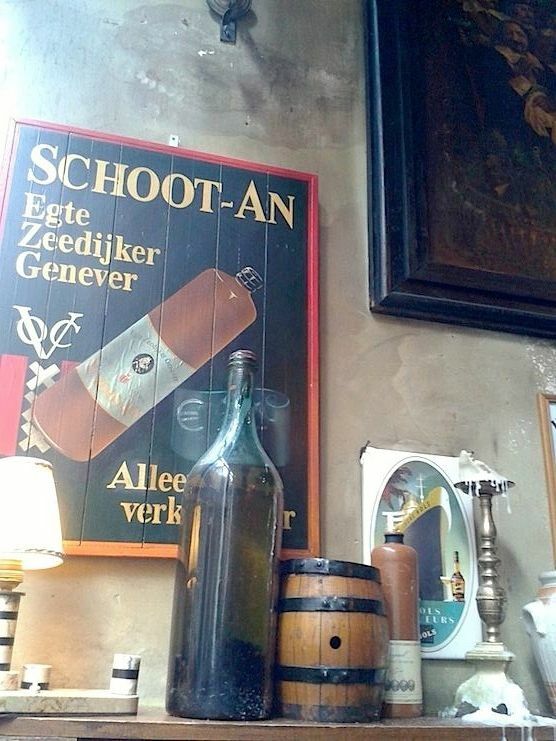 Since then the gimmick of the place where old theatre doors and old advertisement signs decorate the scene, together with old stone jenever bottles. The interior of Cafe In ‘t Aepjen. Old bottles of Jenever (which is Dutch gin), signs that promote portions of Dutch meat and cheese which are available for 4 Euros. You’ll get a full glass when you order a white wine, that’s pretty nice as well! If you wouldn’t know that this bar, located on Zeedijk 1 (Sea dike 1), is such a little treasure you’d easily walk by it. 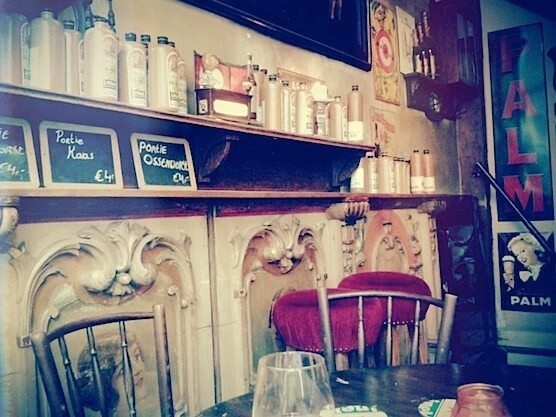 Cafe In ‘t Aepjen is definitely a special bar, which we would like to recommend to everyone! 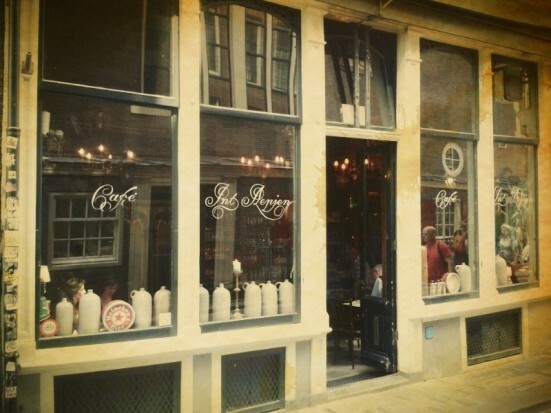 Go visit this cafe, have some typical Dutch treats, like Jenever or some cheese… And enjoy everything around you. A classic, style-full and timeless interior… A perfect place for a nice drink and a good old talk with your friends. Full of vintage details, Cafe In ‘t Aepjen with a complete wooden frontage is definitely worth a visit. If you’d stand in the street in front of this cafe, look up to see the whole building. It’s really amazing! 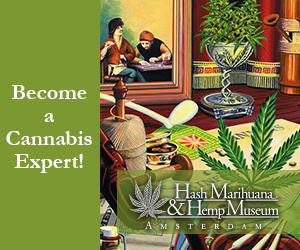 For the connoisseurs and only 500 yards from Amsterdam’s Central Station! Amsterdam The Barderij is stopt with schootan.